Moving time again? Hopefully this time it’s not just from one temporary place to another, but to a home you can really be proud of and see yourself living in for a long, long time! Or maybe you’ve decided it’s just time to upgrade the furniture you got from that furniture megastore. Either way, you’re googling around for a smaller retailer: how do you know you’re getting what you need when you shop for furniture online? What should you look for? What’s different about shopping for furniture online from shopping for furniture in a brick and mortar store? Unless you’ve got some in with the owner, you don’t really know who you’re buying furniture from, and if you can trust them. When you first think about this, it can be really nerve-wracking! Are you going to get scammed, is the furniture durable and of high quality? How can you find out? Thankfully, this is only getting easier with online shopping as we all become more and more connected through the internet. You don’t have to be a super sleuth to put the internet to work for you and help you find what you need when you’re shopping for furniture online. Through the company’s own website, and very likely through their social media presence, you can learn how long they’ve been in business and what people have to say about them. Continuity and consistency is what you’re looking for: have they been in the same location for a few years with their brick and mortar? Are people satisfied with their furniture and the buying experience? You don’t have to look too hard when shopping for furniture online to find these things: many businesses are on review sites like Yelp, and most start their own social media pages, like Facebook, which will include reviews. A confident business will include more than a couple of cherry picked testimonials, and have a detailed “Reviews” page on their website, like Zin Home does! What do people say about the experience of buying from the retailer in their reviews? There will always be an outlier, with the manager logging on under a fake name to say they’re the best in the business, or someone with a chip on their shoulder going after them, but the reviews should mostly average out to a clear picture of what buying from them is like. Again, the more social media presence a retailer has, the more reviews you can read, often on sites (like Facebook) that don’t allow the reviewed to delete the reviews. Remember, not everyone is an interior designer and that is perfectly fine! 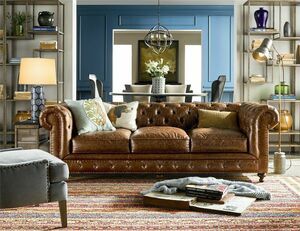 Try to shop on furniture websites that offer Room Ideas or Collections that would help you get inspired when buying furniture. Also, If you are purchasing multiple items buy them from one retailer to be sure you have consistency on colors, stain, type of wood etc. 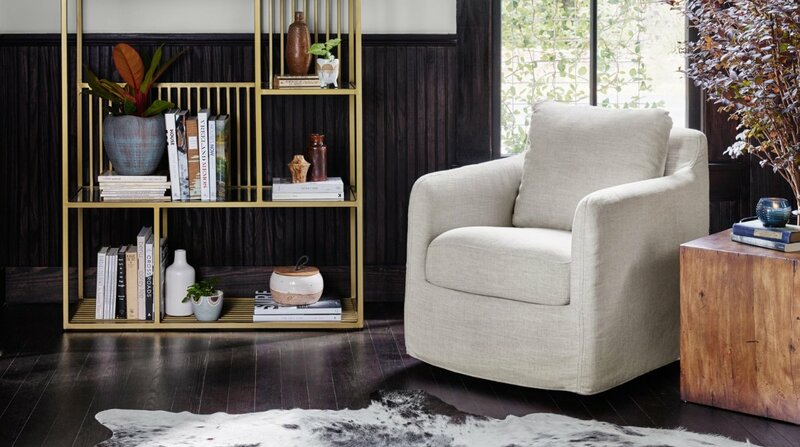 Some online furniture stores, like Zin Home, will have sections to group pieces of furniture by their aesthetic. 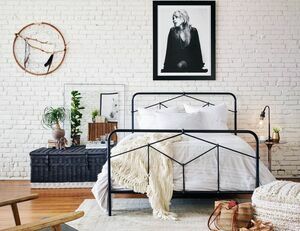 The “industrial” look is grouped together in “The Industrial Loft” collection,or reclaimed, rustic and all wood furniture is grouped under the “The Rustic Farmhouse” collection to help you navigate and find matching pieces easily. To be honest colors and tones can be tricky. One picture might look different on two separate computer screen because of its screen color and light settings. 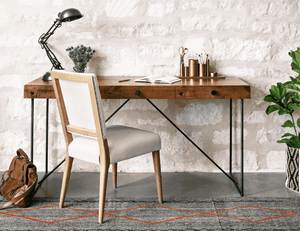 So it’s not always clear from the online photos on how these will match with your space, so contact the retailer and ask about swatches of color and fabric patterns they can send you so you can check with your space! If you can go into a brick and mortar store to check out the furniture, all the better. But even if you’re completely doing your furniture shopping online, the website should be able to help you out: check for measurements of all pieces of furniture and other details and instructions, which retailers often include in a description you might find under a “+” sign or scrolling down the page. Don’t forget to check your measurements not only for the space you’re going to put your furniture in in, but for any hallways, doorways, etc. you’ll have to carry it through. Contact us if you have any questions about this. Once you’ve selected your furniture, make sure to check (or ask!) about shipping costs, taxes, terms and conditions: all the “fine print”. Especially be sure to ask about their return policy. If you can’t choose between two pieces of furniture, you want to know what changing your mind would actually mean! 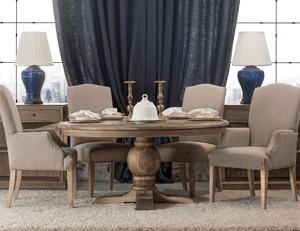 We at Zin Home offer easy returns and Free Shipping for all home décor, lighting and even large bulky furniture pieces. Make sure the website you’re buying from has a website url that starts with “https” instead of “http”, for your web security! If you’re shopping for furniture online, you’ll be giving your name, address, credit card information. For your peace of mind, don’t neglect this simple check! Don’t be afraid to call or e-mail Zin Home to get help with any of this. Retailers want to make sure you’re confident in your decision to shop with them, so you recommend them to other customers. They will be happy to consult you on pairing furniture, budgeting, and any other logistics mentioned in this blog entry. We want the whole process to go smoothly for your and our sakes! We hope you found this guide useful, whether you shop with us at Zin Home, or whether you go somewhere else. If you found this and you’re not in the US, don’t hesitate to e-mail us and check out our International Shipping policy!